My friend is starting a business making Kydex gun holsters and asked if I would be willing to help him make a few jigs and tools to help him get started. The first thing I built for him is this Vacuum Press table. After doing some internet research I settled on a fairly simple design that uses a shop vac to create the suction, though we may later modify it to run on a dedicated vacuum pump. It really is just a simple box with perforated peg board forming the table top (I did use a 1” dowel in the center to provide support”. I made the box sides and top sides in one piece and ripped the top off at the table saw. All if the inside joints are sealed with silicone caulking as is the base of the box were it attaches to the base board. The top has a sheet of silicone that is attached using double side tape and staples. The seal on the box is created with 1/2” wide by 3/8” deep weather-stripping. We got a couple of toggle clamps to put some serious pressure on to form a nice tight seal. To make a holster the Kydex will be heated to 350 degrees and then the gun mold will be placed on the vacuum table and the Kydex placed over it. The lid is clamped shut and the vacuum turned on. The suction will force the material to mold itself around the gun mold. Well done….I may borrow your idea for future reference…thanks for sharing ! I always wondered how the Kydex holsters were made. Sounds like it’s actually a pretty low start up cost. This process is actually very similar to one we use at work for pre-molded foam in place poly urethane packaging cushions, using the Sealed Air part A & B chemicals, Where the vacuum draws the film tight around a product mold, and then the foam is sprayed into the mold box and the top is clamped while the foam rises and fills the box. Nice job, looks like your getting some good suction and its working well….. Thanks for the kind comments. I can’t wait to see it in operation at my friends shop. I will post more pictures of the press in action. I made one of these awhile ago. I got a sheet of latex from the dentist and worked pretty well. Nice build! If you switch to a vacuum pump you will probably need a reserve tank to pull the air from around the mold quickly. Any old air compressor tank should work. I have a very small surplus pump attached to a 15 gallon tank taken from the trash. Of course the smaller pump is cheaper but it will limit how many pieces you can do in an hour. I just let mine run all the time when I need to pull a vacuum. Thanks Chris. That is what he has in mind. We used the shop vac for the first run and it worked well but everything thing that Frankie has been researching suggests a vacuum pump with the purge tank. That is in the works now. where do you purchase the plastic sheets? Is that just a piece of peg board for the base or did you drill the holes? did you have to seal the vacuum port with anything special? I’m really excited to try and make one of these (if you couldn’t tell)! The silicone sheeting for the top of the vacuum table is purchased from Blue Light Tactical. 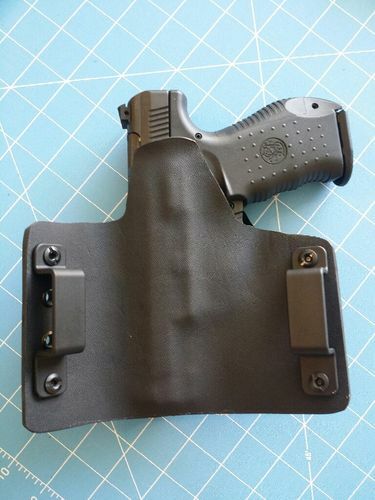 The actual Kydex sheets that make up the holster can be bought at Indexfasteners.com. Yes I used peg board for the table top, I supported it in the very middle with a 1 inch dowel. I did not have to seal the vacuum port with anything, I just made it a very, very tight friction fit and it worked fine. We have a vacuum pump on order and when we get it I will make a cover piece that will have the vac pump hose fitting built into it and will simply attach it over the existing hole, sealing it with silicone caulking. 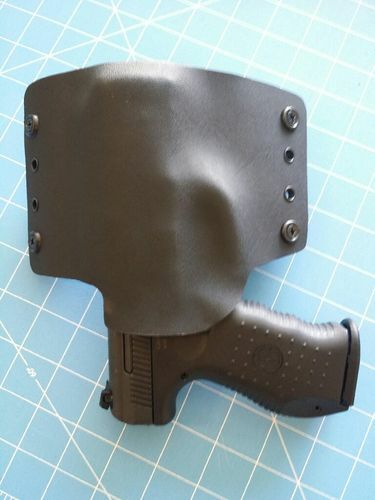 Here are a few images of the first holster we made using the vac table. Anthony – very nice. I am wanting to make a vacuum press that will press wood laminates together – immediately after applying glue or epoxy. The table flat area needs to be about 30 by 30—do you think the shop vac will likely hold them together with enough pressure. Have you or anyone else tried that? I may have to build one and test—but I would like some input first. Great Idea! I’ve been wondering where to buy a holster made with Kydex for my hammerless handgun since it appears all the focus has been on the auto styles. I gave up on those when I left the army, never did like them. Although the Kydex is expensive to purchase in sheets, your design is far cheaper to build than to buy so it may very well be a nice tradeoff to solve my problem. The associated hardware for forming your own custom holster is relatively cheap to buy as well.